Sunrise casts a rosy glow over the parked orbiter Atlantis after a successful flight. 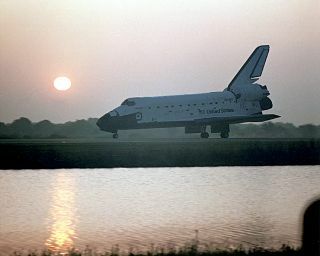 In this historic photo from the U.S. space agency, the sun rises the morning of April 2, 1992, casting a rosy glow over a steller performer, the orbiter Atlantis parked on Runway 33 of the Shuttle Landing Facility. Atlantis touched down at 6:23:6 a.m. EST, completing a highly successful flight that was extended by a day to further the scientific research being performed on the Atmospheric Laboratory for Applications and Science-1 (ATLAS-1) payload. On board OV-104 for Mission STS-45 was a crew of seven.